Here is a recipe from Carlo Middione the chef/owner of Vivande on Fillmore Street. 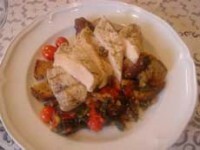 It chicken served with Tuscan bread salad with fresh tomatoes. Yum! Cut each breast in half so you have eight pieces. Lay them on a counter, cover with a piece of wax paper, and pound with a meat pounder until about 1/4 inch thick. Rub both sides of each piece of chieken with olive oil, and sprinkle with salt and pepper. In a medium-size saute pan, heat the remaining olive oil with the garlic, cook, stirring for 2 minutes. Add the clean greens, cover briefly, and cook stirring, until wilted, about 4-5 minutes. Remove from heat. Cut the cherry tomatoes in half, salt lightly and bake in a medium saute pan in a 350 oven for about 10 minutes, until partially wilted. Remove the pan from the heat, remove the cherry tomatoes from the pan, into the pan add the scallions with 1 Tbs. olive oil. Cook over moderately high heat until the scallions are softened, about 3 minutes. Add the vinegar and stock and boil briskly for 2 minutes. Toss in the bread cubes all at once. Season liberally with salt and pepper. Add the tomatoes. With a pan of warm greens, and a pan of warm tomato-bread salad, it is time to grill the chicken breasts, over a charcoal fire, or in an iron pan with ridges, grill the chicken pieces, 4 minutes on each side. 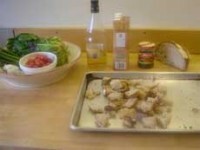 Place the greens, tomato mixture and chicken on individual plates and serve.